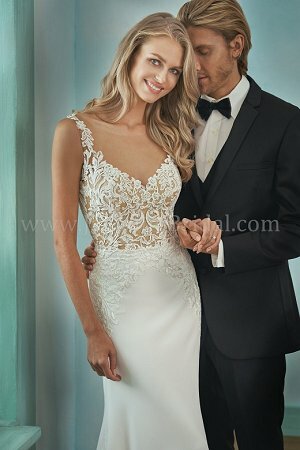 Beautiful stretch crepe and silky jersey fit and flare bridal gown. A flattering illusion front neckline and bateau back neckline. Pretty lace on the bodice and going down the skirt. This lovely wedding dress is completed with a tiffany train.